My last post discussed the basics of latissimus dorsi anatomy, mechanics, and how you know if your lats are an issue in your circus training. I also shared my favorite test to measure and track progress in lat flexibility. 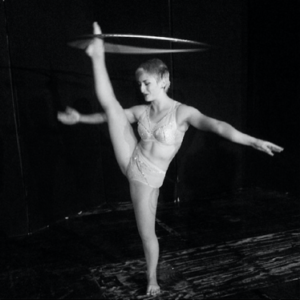 In this post, I’ll talk about some common misconceptions I’ve seen in the circus community regarding stretching in general. I’ll also introduce a more comprehensive way we can improve lat flexibility safely and effectively, that also will help to prevent injuries. Passive flexibility: The total length a muscle can stretch when it is being pushed by an outside source. This could be gravity, like when you’re sitting in over-splits, or it could be in contortion class when your instructor is cranking your leg into flat middle splits. Active flexibility: This is the ability of the muscle group that is opposite the muscle being stretched (the agonist muscles) to overpower gravity (WITHOUT assistance from an outside source) and move the limb as far as possible into the stretch. An example of this is doing a develope into an arabesque in contortion or dance- your glutes and posterior leg and trunk muscles have to do the work to move your leg into the highest arabesque position possible without assistance from your arms or your instructor. ​End-range control: This is the ability of the muscles surrounding the muscle group being stretched to hold the limb at the end range of motion and do the fine-tuning adjustments that need to occur to either keep the limb at end range, or move it safely from one position to the other. A great example of this is when you’re working on side-scales. You first start by using your arm to hold your leg as high as possible, then when your leg is as high as it can go, you release your arm. Does your leg drop down a little? This means you may need to work on end-range control of your flexibility. Cardio. I know, we all hate cardio, but you HAVE to do it. Do some jumping jacks, run around, jump rope, do SOMETHING to get your heart rate elevated for 10 minutes. Yep. 10 minutes. Just do it. Soft tissue prep: spend some time using a foam roller, lacrosse ball, or peanut to address the muscle group that is about to be stretched.The purpose of soft tissue prep is to release tight muscles and activate the neuromuscular system in order to achieve more effective muscle strengthening and stretching afterwards. Active flexibility. After passive stretching comes active stretching. There are a number of different ways to do this, but I like to take the muscle through a full range of motion into end range of motion, usually with resistance via a weight or a theraband. My favorite type of active flexibility exercises not only activate the mover muscles surrounding the stretching muscle, but also your core…the body works as a whole, not as separate pieces, and I like to train active flexibility in this manner. End range control. With end range control exercises, I will typically start by only focusing on activating the antagonist muscles in the last 10-20 degrees of active range of motion of that joint. This is usually the most difficult component of flexibility, and tends to be incredibly tiring for these muscles. I believe that this is aspect of flexibility training is a KEY component in preventing injuries in performing artists. Now, lets get specific to stretching the lats. What are the key players involved in improving flexibility and end range control? The muscles that have to do most of the grunt work involved in active flexibility and end range control of the lats are the parascapular muscles and rotator cuff. The parascapular muscles are a group of muscles that attach to your scapula, shoulder, and/or neck and upper back. These are the muscles that need to be strong enough to control all of that range of motion we get from our passive stretching (with or without instructor cranking!) The rotator cuff, as discussed in previous posts, is in charge of the fine movement adjustments that need to occur throughout shoulder range of motion, but especially at end range, to keep the “ball” of the humerus centered in the “socket” of the scapula. 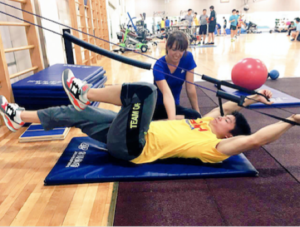 The following exercises are my favorite starters for safe and effective lat stretching. I like to do these before circus training, in order to properly activate all of the parascapular and rotator cuff muscles before putting them through the rigors of aerial or acrobatic training. I’ll typically also do some passive and PNF stretching after training, as well. This is an awesome mobilization that can be done with a peanut or foam roller. First, place the peanut/roller here. Then, move from bent arm to straight arm overhead. This often takes some peanut-adjustment to find the appropriate spot, so if you’re not feeling the “hurts so good” muscle release, move the peanut back a little or down a little. I suggest 10 repetitions per position, per arm, for the best effect. What’s this, you ask!? A foam roller AND A water bottle in ONE?! GUYS. I got this for Christmas, and it is my new favorite PT gadget. It hurts. So. Good. And then it apologizes by hydrating you. This is my favorite lat stretch. The classic lat stretch we see all the time in circus arts- where your hands are on a wall or bench, with your back arched, allows for a lot of compensations that don’t let the lats stretch fully. This stretch also adds in an extra component of external rotation (from the block). This stretches the fibers of the lats that are responsible for internal rotation of the shoulder, which most typical lat stretches skips. Being in a “childs pose” position doesn’t let you substitute by arching your back. PNF contract-relax: gently push your elbows down into the bench while squeezing the ball/block. Hold for 8-10 seconds, then relax and stretch slightly further. Focus on keeping your ribs in during this whole stretch. If you let your ribs splay out, you’re allowing spinal extension, which is one of the most common compensations during lat stretching, and significantly decreases the effectiveness of this exercise. You should feel this stretch in your LATS (shocking, I know). If you feel a pinching sensation in the front of your shoulders, back off the stretch and widen your elbows. If it persists, STOP. This is my favorite starter exercise to encourage parascapular muscle activation and active control of lat flexibility. It also is a GREAT core exercise, if done right! Bring arms only as far overhead as you can WHILE KEEPING YOUR LOW BACK FLAT ON THE FLOOR. This exercise is pointless if you bring your arms all the way overhead but your back is arched. Return to start position, switch legs. You absolutely MUST breathe during this exercise. If you hold your breath, you substitute by using your diaphragm instead of your abs for the core strength component. Keep your ribs in and your low back FLAT on the mat the whole time. The second you start to arch your back, it is no longer an active lat stretch. With this exercise, since this activates muscles that should be “on” to some extent the whole time you do any upper body activities, I do two to three sets to fatigue. This is a great exercise to focus on activating your rotator cuff and scapular muscles during overhead, end-range activities. It looks easy, but is deceptively difficult! Start in childs pose with your thumbs up. 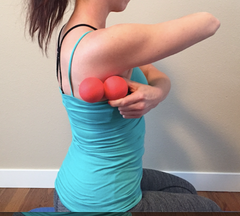 With one arm, first engage shoulder elevators by shrugging your shoulder up slightly. From here, lift your arm up as far off the floor as you can. It may not be very far, but thats ok! Hold this end range position for 5-10 seconds, then switch. This should also be done 2-3 times to fatigue. These three exercises are a great start to SAFELY improving your lat flexibility, and would be a good addition to your current warm up. Be sure to measure your progress, too! Take a “before” photo using the measurement method I wrote about in the last post, then see how you improve in the next few weeks! But as always, LISTEN TO YOUR BODY! If one of these exercises doesn’t feel right, don’t do it…if you have shoulder pain, go see a physio- you don’t need to live with pain! Questions? Comments? Feel free to post below! 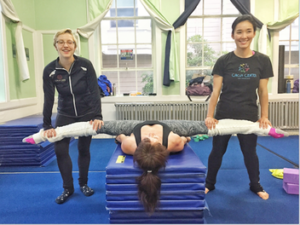 Jennifer Crane Physical Therapy, INC is located in the Cole Valley neighborhood of San Francisco, inside Circus Center.